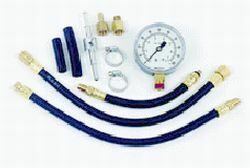 This basic fuel injection tester includes large and small Schrader adapters, M6 – 1.00 o-ring adapter, and Tee manifold. Includes everything necessary to test the following systems: American Motors; Bosch AFC, MPC European and Japanese (except C.I.S. – use our TU-447); Chrysler Corporation; Ford Motor Company; GM (except T.B.I. – use our TU-446); Japanese fuel injection systems; and other systems using Bendix-type fuel injection or a Schrader-type valve, including the small Schrader valve found on T.B.I. and Multi-Port Fuel Injection Systems on Ford products. The 2 ½ inch gauge has a dual dial with ranges from 0 – 100 psi and 0 – 7 bar. Packaged in a durable, red blow-molded case for easy access to equipment and for manageability.